T Rick Wagner vs. 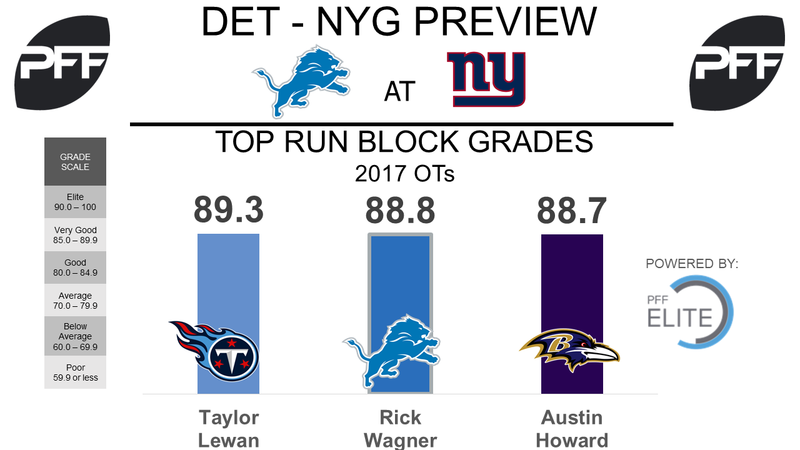 EDGE Jason Pierre-Paul – In Week 1, Rick Wagner was one of the best offensive tackles, earning the fourth highest game grade at 85.1 overall. He was dominant at the point of attack in the run game (88.8 run block grade) and kept his quarterback mostly clean allowing just two total pressures on 43 pass block snaps. Meanwhile Pierre-Paul was solid in his own right, earning an overall grade 78.5 which ranked 23rd among edge defenders. Despite the solid grade Pierre-Paul struggled rushing the passer, generating just four pressures on 37 pass rush snaps. The highlight of his week came while defending the run earning an 84.7 run defense grade and notching two run-stops. TE Eric Ebron vs. S Landon Collins – Ebron didn’t have the start to the season he hoped for, producing an overall grade of just 60.1 overall. Surprisingly his best work came on his 15 run-block snaps, where he earned a run block grade of 74.5. Ebron struggled to get open through most of the game on his way to earning a 48.2 overall receiving grade. Collins continued his elite play right where he left off, earning the second highest safety grade of the week at 91.4. Collins was excellent in coverage, allowing just three yards into his coverage on one reception. He also added two run stops while defending the run and a pressure coming off a blitz. WR Golden Tate vs. CB Dominique Rodgers-Cromartie – Tate has been the primary source for offense in Detroit’s passing game since joining the team back in 2014. Week 1 was no different, as Tate earned the highest grade among Lions wide receivers at 77.5 overall, a grade good for 18th best on the week among all receivers. This offseason the Lions moved Tate to the slot full time while the Giants have committed to using Rodgers-Cromartie to defend the slot full time. Rodgers-Cromartie was solid covering the slot in Week 1 giving up just two receptions on 28 slot coverage snaps. WR Odell Beckham Jr. vs. CB Darius Slay – If Beckham plays this could be one of the best matchups of the weekend, so it’s worth being highlighted. In Week 1 Beckham’s replacement, Roger Lewis, played 67 percent of his snaps at right wide receiver and Slay spends most of his time at left cornerback. In 2016, Slay earned an 83.2 overall grade – 16th among corners. Beckham’s 2.43 yards per route run over his career ranks first in the high-profile 2014 wide receiver draft class. 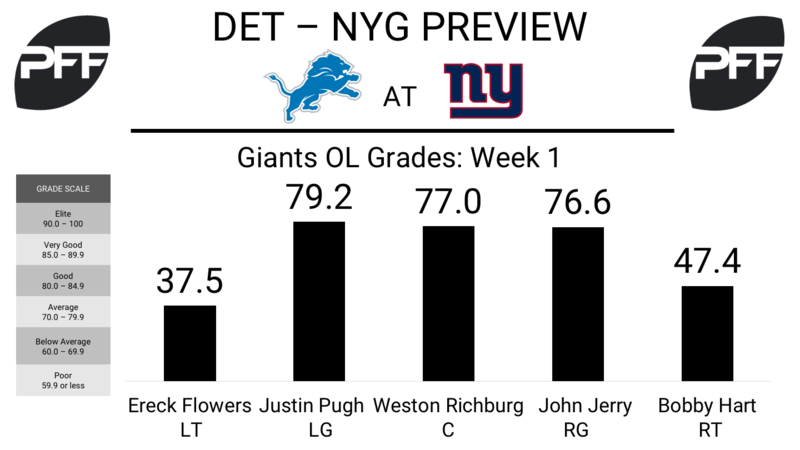 TE Evan Engram vs. LB Jarrad Davis – In Week 1 the Giants used Engram at tight end in line (66 percent) with how much he was there in the preseason (65 percent). However, he was used a lot more as a slot receiver (30 percent) like he was in college (75 percent of his routes were run from the slot). Jarrad Davis was one of the worst linebackers in coverage this past week. His 34.8 overall grade ranked 103rd of 109 linebackers, so the Giants would be smart to utilize Engram down the middle of the field. T Bobby Hart vs. EDGE Anthony Zettel – Hart had a promising preseason, not allowing a pressure through 42 pass-blocking snaps. However, last week he allowed six pressures and earned a 47.4 overall grade. Zettel has previously played the majority of his snaps at defensive tackle on the interior, however he played 94 percent of his snaps outside of the tackle this past week. His seven total pressures and 19.0 pass rush productivity ranked fourth among 4-3 defensive ends for the week. He has a favorable matchup in Hart and should get the better of him.